The work of husband and wife Matthew Metz and Linda Sikora is displayed side by side. Well, that is a bit dramatic … though that was Shakespeare’s point, wasn’t it? So is love a labor lost in the new exhibition in Strohl Art Center? “Contemporary Couples: A Creative Life Together” is that new exhibition, positioning eight artists, four couples, as the Visual Arts at Chautauqua Institution’s contribution to The Romeo & Juliet Project, an inter-arts, Institution-wide effort in search of common ground encouraged within the crucible of Shakespeare’s huge drama. But does the “couples” conceit smother an opportunity for the singular appreciation of eight fine artists — force-fit into four — the four couples who are the titled subjects? Is our awareness directed toward how one artist’s work shares ideas — or differs with — the aesthetic concerns of her partner? Are we to engage what might be called feminine, or masculine, in the art we see? Do we compose her work in terms of its association with her partner’s, or in accordance with its singular, unique aesthetic? Is our search for a key to understanding the exhibition directed toward whatever we construct as pertinent to a social partnership — and not to the individual art object? Is it to be the spectacle in this couple’s work, and the form in this other couple’s, and science in theirs, and the materials in that fourth couple’s? And what can be said of “a creative life together” from just several works by her and the same number by him … “her and him” since all the couples are heterosexual? What, then, is a couple in our age? Life magazine engaged the great photographer Eugene Richards at least 20 years ago to document the American family, and he came up with more than a dozen variations on the answer — not all of them published. O Romeo, Romeo, wherefore art thou, Romeo? Erika Osborne and Tracey Stuckey work in the West, Osborne teaching at Colorado State University. Their art is figurative, all about the Western scene, but their work comes from profoundly different views and philosophies about place. Stuckey takes broad figurative swipes at the popular mythology of the cowboy and his Native American doppelgänger. The Big Chief in headdress and running shorts poses on the pavement of a used-car lot for a cellphone picture taken by a 21st-century cowgirl. These are large oils on linen. Center stage in another picture is a bikini sunbather oblivious to a cowboy with a ray gun on a rearing horse just behind her. Stuckey’s cascade of hyper-reality contrasts with Osborne’s droll commentaries about hidden realities in big-sky spaces. She provides a rainbow at Hoover Dam, a misty chasm fit for J.M.W. Turner, and scary scenes of ambiguous purposes and buildings outside the radar. Does knowing they are a couple enhance understanding? David Provan makes sculpture and Ann Knutson Provan does small abstract watercolors. They share grounding in science — widely disparate points of view, though both provocatively thoughtful. David balances between atomic and cosmological theory; Ann anchors in perception studies, particularly inspired by the jewel array of testing diagrams for colorblindness. David drills into — and builds out of — space; swirls of electron rings describe a central core in one piece, while a rectilinear proposal worthy of deep space animates a laconic steel plate in another. Ann’s watercolors are wonderful, too, as she breaks apart the tight color test field of multicolored dots into gentle floating bubbles of color theory and spirituality worthy of Josef Albers and Mark Tobey. Curator Barie does not usually couple the couples in her wall design. She discovers other conjunctions of color or design to break apart the social pairings. But she doesn’t break up the vases, pots and bowls of two Alfred studio potters, Matthew Metz, a National Endowment for the Arts and a McKnight Fellow, and Linda Sikora, a professor at NYSCC. 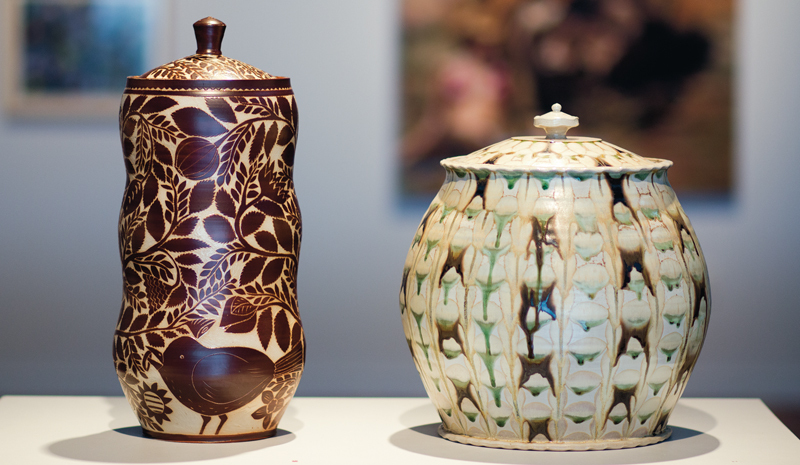 Master ceramicists both, Sikora works with quiet, reflective elemental forms, while Metz dynamically brings new life to quotations from East and West Coast Arts and Craft design traditions. Their work “contrasts and compliments each other,” Barie declares. So, says Juliet, “do not swear by the moon, for it changes by the month.” What to make of this provocative show? Likely one can find a synergy of association made more intimate by social intimacy, though not with any confidence here. Together or apart, or just an exhibition conceit for the fun of it? See the work for itself. That I shall say goodnight til it be morrow. Anthony Bannon, once the theater and dance critic for The Buffalo News, is executive director of the Burchfield Penney Art Center and research professor at SUNY Buffalo State.